AUDIENCE: It may be more appropriate for student veterinarians who want their insight into dogs to go beyond anatomy and pathology, than for behaviourists seeking to deepen their general knowledge of the dog. REVIEW: This book is quite reminiscent of of Lindsay’s “Handbook…” in terms of style and coverage. I like it a lot and I would have it as a must-read if it was not a little redundant with its fellow must-read (Lindsay’s “Handbook”). It is shorter than Lindsay’s, in its defence (that bugger took me the best part of 1.5 years…). Linda Case’s book is a literature survey on what was ‘known’ (to whatever extent we ever know anything) about dogs in the scientific community at the time of writing (2005). In other words, it is a condensed collection of reliable information about dogs which will give you the confidence to identify and refute old wives’ tales. 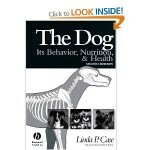 It will also help you understand the dog as a subject of scientific study. The writing style remains academic, of course, and this text can easily be used as a serious reference for whatever publication you intend on writing in a related subject. What makes the book strong, is perhaps also its weakness, is that it covers a broad area without being too voluminous (well, it is 500 pages, but if you compare it to Lindsay, it’s virtually a beach magazine). But it simply is not long enough to cover some of the topics at sufficient depth. I also felt, at times, that the choice of particular topics (within chapters), was a little random, but having said that, this is my comment to just about any book trying to tackle all scientific information about dogs in a holistic way. It’s an impossible task. Having said all that, I am very positively biased towards the author. We talked a lot for an interview I wrote about her, and she was just adorable. So, basically, buy it. She’s lovely! Browse the Book Review archive. Genre: survey of peer-reviewed literature. Author: Case Linda P. Reading Level: Academic. Star: 4. Bookmark the permalink. Post a comment or leave a trackback: Trackback URL.